D&P proudly opened four terrific new exhibits in 2017. While all are history focused, they showcase the diversity of cultural experiences across the country. From medical history to sports, the interaction of people and their landscape, and the Bible, each exhibit adds dimension to the nation's rich, cultural heritage. Here is our 2017 story. BLUE MOUNTAIN LAKE, N.Y. - Connections form the core of the Adirondack Experience’s new exhibition galleries. Soundscapes, full-body digital interactives, video and cultural artifacts blend to give visitors a sense of the landscape and the generations of people who experienced the Adirondacks before them. The museum and its designers were inspired by the Adirondack Park and its surrounding region as the natural, economic, and social resource that connects people across generations and to the land itself. Designed by Gallagher & Associates, personal stories connect contemporary visitors to their forebearers. The new exhibits evoke the outdoors while introducing visitors to the panoply of people who lived, worked, and visited the Adirondack region. The galleries provide a fun, active, and educational way for visitors to immerse themselves into the reality of life, work, and recreation in the Adirondacks. “We remain steadfast in our mission to expand public understanding of Adirondack history and the relationship between people and the Adirondack wilderness,” explained Museum Director David Kahn. Five galleries across 19,000 square feet encourage Adirondack visitors to deepen their appreciation for what's special about the region and to explore how people have lived, worked, traveled, and played in the Adirondacks from the 19th century to today. D&P’s scope of work included fabrication and installation, graphics, audiovisual, lighting, scenic work, and casework. WASHINGTON, D.C. – A historic, 1923 former refrigerated warehouse is home to the most talked about museum to open in Washington, DC in 2017: The Museum of the Bible. Blending cutting-edge technology, inspirational texts, and extraordinary artifacts, the exhibits exceed on the Museum’s goal to deeply engage visitors in the Bible. Designed by The PRD Group—who were also responsible for overall project coordination for multiple exhibit teams—the History of the Bible exhibit explores the Bible as a collection of oral traditions and writings. Initially accessible to very few, the Bible underwent major changes in form, making is available to increasingly wider communities around the world. History of the Bible features more than 600 artifacts and 50 media programs spread over 30,000 square feet and organized into 11 galleries. “We want this museum to be enriching and engaging to all people,” said Cary Summers, president of the museum. D&P’s scope included fabrication, installation, and media integration for the fourth floor’s History of the Bible. The exhibition immerses visitors in the Bible’s journey through time, technology, and culture. NEW BRUNSWICK, N.J. – Johnson & Johnson, the world’s largest healthcare company, introduced visitors in 2017 to Johnson & Johnson Our Story at the Powerhouse. One hundred thirty years of medical innovations display the Company’s profound impact on human health. 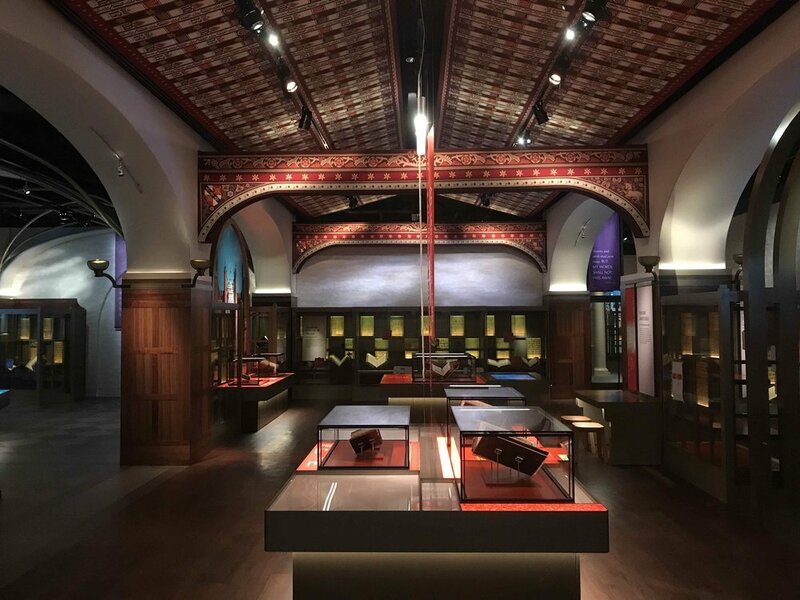 Eleven distinct exhibits, designed by Gallagher & Associates, take visitors on a multi-sensory journey though not only Johnson & Johnson’s history but also the evolution of modern medicine. Johnson & Johnson’s extensive collections of medical artifacts are artfully displayed in exhibit cases. Digital interactives encourage deep exploration. Large-scale graphics bring the past into the present. Alex Gorsky, Chairman and Chief Executive Officer of Johnson & Johnson described the exhibit's significance. "Our heritage is more than just a look back at the past—how our products have profoundly impacted individuals, families and communities. It's a look at our present and future too—a way to inspire and guide us to an even brighter and more meaningful future for Johnson & Johnson." D&P’s scope of work for Johnson & Johnson included graphics, artifact mounting, display cases, audiovisual, and installation. DETROIT, Mich. - The Detroit Pistons NBA basketball and Red Wings NHL hockey teams moved into their new digs at the Little Caesars Arena in 2017. The complex anchors the new Olympia entertainment and sports district, stimulating downtown Detroit’s revitalization. The move unites the City's four pro sports teams (Tigers baseball, Pistons basketball, Red Wings hockey, and Lions football) within cheering distance downtown. Christopher Ilitch, CEO of Ilitch Holdings, called the arena and its exhibits "a monument to Detroit's sports history." Detroit’s history is the foundation for the city’s renaissance. Sports heritage infuses the new arena with concourse exhibits designed by sports heritage design experts Cambridge Seven Associates. Red Wings memorabilia from the original Olympia Stadium and their second home at Joe Louis Arena pay homage to great players while feeding fans’ nostalgia. Trophies, equipment, and jerseys draw attention in cased displays. Interpretive panels honor great players and winning teams. The fan-favorite photo-op at the old wooden player’s bench from Joe Louis Arena invites fans to sit in the same spot as Hall of Famer Steve Yzerman. D&P’s scope of work for Red Wings heritage exhibits included graphic rails, exhibit cases, locker room try-ons, the practice ice west, and the Bench and Penalty Box areas.